If you’ve been looking for a large press for your school or studio, this is it! This heavy duty press has been carefully designed from top to bottom specifically for the hand papermaker. It is not an adaptation of a commercial H frame press. Specially designed features on this handmade press make the papermaker’s task much easier. The electric hydraulic pump eliminates tedious hand pumping-just hold the switch and the bottom platen automatically raises. It comes with a pressure gauge for greater control. Quality Norco/Enerpac hydraulics are used. 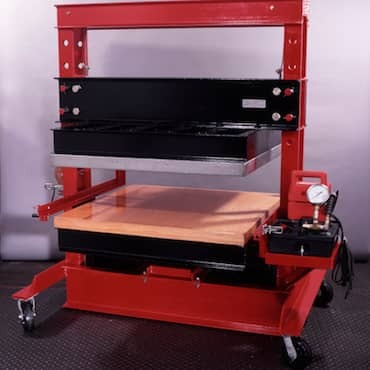 The bottom platen is a comfortable 26 1/2” from the ground. Press features a worm drive winch to easily raise and lower the top platen, so that the ‘daylight’ can be adjusted for varying paper post heights. 6 inch casters are included. The Reina press is available in 2 sizes. 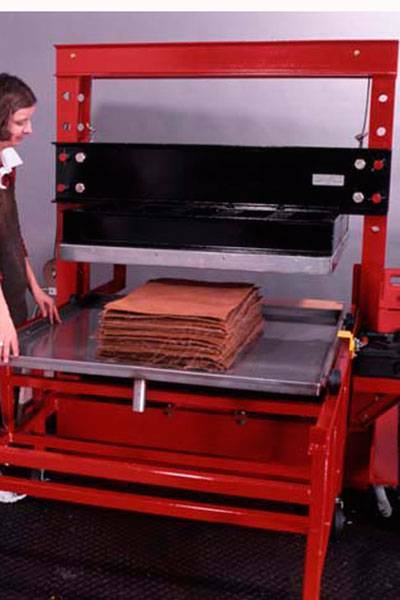 The big press has platen sizes of 34” x 26” and the bigger one has 36" x 40" platens.